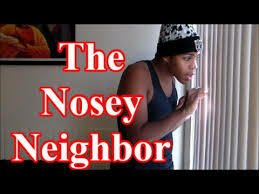 IN THE KNOW WITH RO: HAVE YOU EVER BEEN CALLED NOSY? Before I answer that dicey question, let me give you some background. Years ago, when I was much younger, my life revolved around a ton of activities that included 2 choirs, a band, a PT job, the YMCA, and a whole list of other things. Being so busy caused me to frequently keep strange or erratic hours. Even though the next door neighbor was my mom's age, she seemed to know everything about me, which seemed a little weird at the time. If I came in at 2:30am in the morning, the next day at 9am as I was leaving to do something else, she'd mention that I got in pretty late. When I came home from work, she was often in the upstairs window with a cigarette waving at me. Say what? 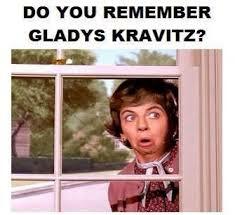 Does anyone remember Gladys from "Bewitched" from back in the day? I'm not kidding when I tell you that this neighbor always knew what I was doing with my day! This went on for years until I joined the USAF, and ironically, I ended up picking up some of the same habits. 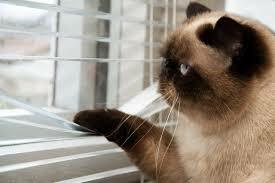 I'm not hanging out in windows stalking people, (lol),but I'm the person who asks a lot of questions. This is mostly because I'm always really interested in hearing romantic or funny stories, and I love soaking up knowledge about really cool stuff. Sometimes, I need to know why a person made a particular decision about something. I think being a nosy person has its ups and downs. If there's a crime in the neighborhood, the nosiness pays off, but if you're cheating on your wife or husband, you're definitely gonna get busted. Now that I'm older, I can't say that it bothers me as much as it did when I was a kid. It's a good way to stay in touch. Anywho - what about you? 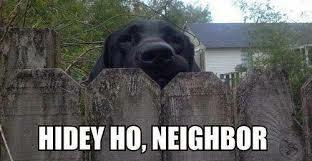 Do you know all the dirt on your neighbors, or do you pretty much keep to yourselves? I live in an apartment complex and with neighbors like mine who tend to argue outside or with their doors open, it's easy to hear what's going on. I'm not nosy and I do tend to keep to myself but it's not hard to see what's going on around here. That's how it can be sometimes around here too, Mary. The loudness makes it impossible to not know what is going on in the neighborhood. Hugs.. I live in a neighborhood in an older part of town that used to be the kind where two and three generations of a family stayed in the same home, but that is slowly changing as the young ones don't want these older houses and the old guard is dying off. Some sat empty through the financial crisis, but they are selling now or getting rented out so there are people moving into the neighborhood. My neighbor, kitty-corner from me, is the one who gets around and stays in the know. She will tell you everyone's business so its always wise to be circumspect in what you let her wheedle out of you. She isn't malicious so nobody resents her. I am a people watcher and I take what they give me, but I don't go out of my way to be in their business. I, too, keep odd hours b/c my job is flexible and sometimes I sit up late into the night when I'm writing so I get to see things that most wouldn't notice on our fairly quiet street. My young college-age neighbors across the way doing the walk of shame from their trucks to their doorstep at 2 or 3 in the am, my older neighbor beside me getting up at the crack of dawn to go out with his fishing buddy who drives up and holds out a cup of coffee to him talking loud because he's nearly deaf. Then there are the young families that are busy during the day and quiet at night. I have a biker neighbor who is a 'Nam Vet and he gets up with his PTSD-fueled night terrors and does meditation with his nunchucks or a staff in his backyard in the middle of the night. We share a back sideyard. I have a neighbor behind me who has a crazy drug dealing brother in law who has twice arrived in cabs he doesn't pay for and begs my neighbor to let him hide out for a while (and its not from the cops) and a third time he was being chased by a bunch of somebodies and hopped the fence to run through my yard and out to another street. That poor neighbor has high fences, flood lights and security to keep said BIL out and for his sanity, he restores old cars and sells them so he has a pole barn bigger than his house and works out there with hard rock from the eighties blaring. Not sure if that makes me nosy or just as I say, a people watcher. Ooh, Sophia, lots going on, in fact, I see a possible book coming out of the things going on, right? (lol) I'm observant, but like you, I don't go out of my way seeking info. I live in a neighborhood that's mostly veterans, so sometimes there are weird things happening like the PTSD thing and others. I'll bet those fishing adventures are super fun. Hard rock from the 80's sounds pretty cool, too. Hugs...and I love your stories. Always super interesting. It was the weirdest thing Lauren. She always knew where I was coming from, at any time of the day or night. Crazy! I don't usually know too much about my neighborhood other than the people immediately on each side- we talk and so naturally I know more about what they're up to, plus some of them have kids running around. There is a neighbor a few houses down who knows everything that happens though lol- she's a source of gossip when people talk in the summertime. :) I think every neighborhood may have one of those?? Hey Greg, I fear you may be right. (lol) I definitely have one here AND in addition to knowing everyone's business, she's super loud when she gets wasted! Hope weekend is fab! I know zip about what's going on in the neighborhood. I'm practically a mole at home:) Though, I admire people that get out and socialize with their neighbors. You're right. The nosy neighbors have their pros and cons. really interesting post my friend,enjoyed it soooo much! 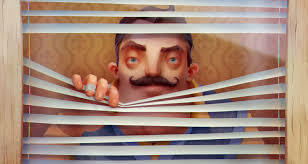 i have more than nosy neighbors who are more than just dirty i mean they are HARMFUL.their nosiness has dark intentions and it is not funny at all. i am completely bore person,never ever been interested in others business specially since i am here among such terrible neighbors. unless it is something where i can offer my help or to fix something. Oh no Baili, that sounds super scary. No need for people to be mean, and I hate that you have to be surrounded with that type of behavior. You seem so kind and don't deserve that. Hang in there! Don't you just hate that Nadene? You mind your business and keep quiet, and people still seem to latch on to your personal affairs. Crazy! So thrilled that you stopped by to say hello!